U.S. Interior Secretary Ryan Zinke announces a ban on mining claims north of Yellowstone National Park as K.C. Walsh, left, president of Simms Fishing Products, listens near Emigrant, Montana, Oct. 8, 2018. The Trump administration is considering using West Coast military bases or other federal properties as transit points for shipments of U.S. coal and natural gas to Asia as officials seek to bolster the domestic energy industry and circumvent environmental opposition to fossil fuel exports, according to Zinke and two Republican lawmakers. The Trump administration is considering using West Coast military bases or other federal properties as transit points for shipments of U.S. coal and natural gas to Asia as officials seek to bolster the domestic energy industry and circumvent environmental opposition to fossil fuel exports, according to Interior Secretary Ryan Zinke and two Republican lawmakers. The proposal would advance the administration’s agenda of establishing American “energy dominance” on the world stage and underscores a willingness to intervene in markets to make that happen. It’s tantamount to an end-run around West Coast officials who have rejected private-sector efforts to build new coal ports in their states. In an interview with The Associated Press, Zinke cast the proposal as a matter of national security to ensure U.S. allies have access to affordable fuels. The Trump administration also has cited national security as justification for keeping domestic coal-burning power plants online to prevent disruptions of electricity supplies. It’s unclear which sites are under consideration other than one in Alaska. Experts said the possibilities are constrained by the need for a deep water port. Zinke said the administration is interested in partnering with private entities to ship coal or liquefied natural gas through naval installations or other federal facilities. He added it’s still early in the process. Zinke specified only one site that could serve as an export hub, for natural gas: the former Adak Naval Air Facility in Alaska’s Aleutian Islands, which he suggested could receive fuel by barge from the North Slope. The base closed in 1997 and has been largely abandoned. Roughly 300 people live in the town of Adak, the westernmost community in the U.S.
Zinke did not reveal government properties that could serve as potential coal ports. Exports have been held up as a lifeline for struggling domestic coal miners since demand for the fuel started to wane a decade ago, when many power plants switched to cheaper, cleaner fuels. The West Coast offers the most economical route for shipments to Asia because of its relative proximity to the largest coal-producing region in the U.S.: the Powder River Basin, which straddles the Montana-Wyoming border. Any export site would need access to deep waters to accommodate large ships and enough land to store fuel awaiting shipment. Few such locations can be found on the West Coast, said Joe Aldina, a coal industry analyst with S&P Global Platts Analytics. With the U.S. coal export market booming in recent months, Aldina said any new port established by the government would quickly fill with coal for shipment overseas. Yet with demand expected to fall over the long-term, particularly in Europe, the current high prices for coal are expected to drop. Aldina expressed skepticism that government intervention could make much difference. “Like everything else the Trump administration has tried to do, it’s a long shot whether some of these things will work, and it’s questionable whether they will really help the market,” he said, adding prices and fuel quality are the main drivers of coal markets, not government policies. That’s brought a backlash from elected officials in coal-producing states, who have blasted Washington Gov. Jay Inslee in particular. They argue the rejection of the Longview port, sponsored by Utah-based Lighthouse Resources, violated the commerce clause in the Constitution that says only Congress has the power to regulate international and interstate trade. Montana, Wyoming and four other states joined Lighthouse Resources in a lawsuit challenging the rejection of the company’s Millennium Bulk Terminals port, which could handle up to 48.5 million tons of coal per year. Rep. Liz Cheney, a Wyoming Republican, said she’s spoken with Zinke and U.S. Energy Secretary Rick Perry about using federal facilities to circumvent opposition to proposed ports. “That might be, for example, retired military facilities or other places where we would be able to use those for exports — frankly, to get around some of the unreasonable obstacles that have been thrown up,” Cheney said. Prior to joining Trump’s cabinet, Zinke was a Montana congressman and Perry was governor of Texas. Both states are among the United States’ top coal producers. Zinke said Commerce Secretary Wilbur Ross also was involved in the proposal. Energy Department officials declined comment. 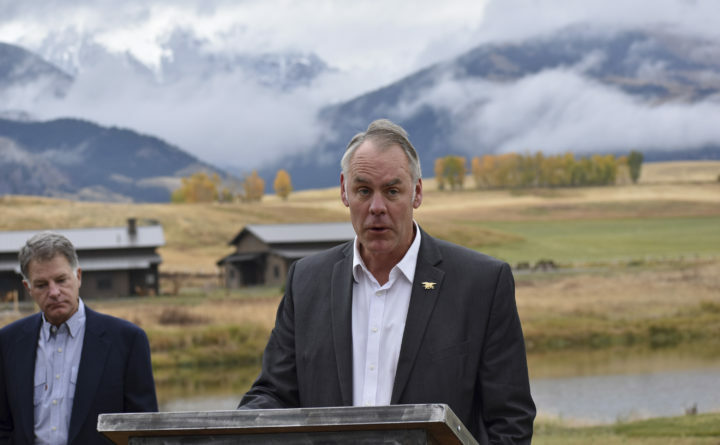 Republican U.S. Sen. Steve Daines of Montana said Zinke was looking at “all possibilities” for export terminals, including West Coast military installations. “As a Montanan, he’s looking for ways here to help these Rocky Mountain states like Montana and Wyoming get access to Asian markets,” Daines said. Coal exports to Asia more than doubled in 2017, according to the Energy Information Administration. The rise continued in the first half of 2018 with nearly 23 million tons of U.S. coal exported to Asian nations through June. South Korea, Japan and China were among the biggest recipients. Despite those increases, the U.S. holds only a small share of the more than 1 billion tons of coal shipped annually by sea. Clark Williams-Derry with the Sightline Institute, a left-leaning think tank based in Seattle, said there’s little chance of that changing in the long-term.